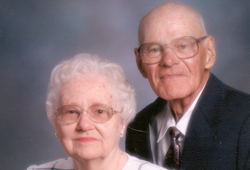 Jim and Marilyn (Carpenter) Richcreek have joined family members in seeing that Ashland University becomes the recipient of their estate plan. The Richcreeks, shortly after moving into their new headquarters at Belmont Tower in Ashland decided to not wait for their deaths to signal the start of an endowed scholarship. Their generosity and conscious planning benefit not only todays student scholars but makes sense from an income tax perspective, as well.